The undisputed growth industry that has done so well since the very beginning of the Financial Crisis, and in fact since 2001, after having plateaued or even declined for years before then, is involuntary part-time employment. Now it turns out, according to a study by the Atlanta Fed, that these folks are also getting hosed when it comes to wage “growth.” With big implications for the economy on one side, and corporate profits on the other. For much of the 90s, part-timers hovered just above 23 million on a flat trend line. But with the recession of 2001, part-time employment began to thrive, and continued to thrive afterwards, reaching 25.4 million by June 2007. 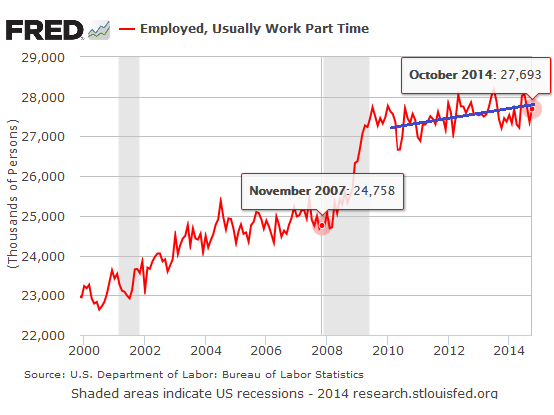 In November 2007, just before the Great Recession officially started, there were 24.8 million part-timers. In 2008, amid soaring layoffs as the financial house of cards was coming down, part-time employment jumped! 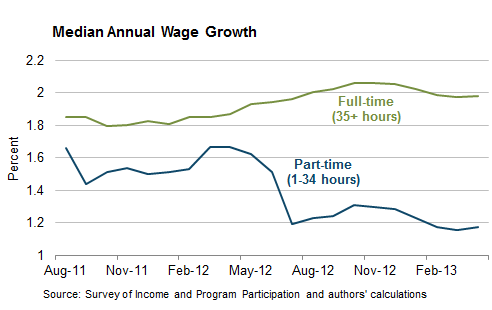 By July 2009, there were 27.7 million part-timers, even as full-time employment was being decimated. That’s an increase of about 3 million since the beginning of the Great Recession – almost 12%! During the Great Recession, this shift to part-time employment was considered temporary, something that would go away during the recovery. Then during much of the “recovery,” it was still considered temporary, something that would go away once the recovery would reach “escape velocity.” Now, that illusory surge in the economy, trotted out for five years in a row to rationalize soaring stock prices, has become a pipedream [read… Fed: Forget “Escape Velocity,” Not Gonna Happen, Ever]. And part-time employment has become a dramatic, still increasing, and apparently permanent shift in how business is done in the US. And it gets worse: The analysis is based on nominal wage data – not adjusted for inflation. But during the years of the analysis, the Consumer Price Index rose at annual rates from nearly 4% in 2011 to 1.7% in the most recent period of the study. The chart shows that nominal wages of full-time hourly workers couldn’t keep up with inflation in 2011 though it has since vacillated between falling further behind inflation and gaining on it. That’s bad enough! But part-timers got outright hosed by inflation, with their wages, even in this aggregate 3-year smoothened line, never growing fast enough to keep up with it. And they’re still falling behind! 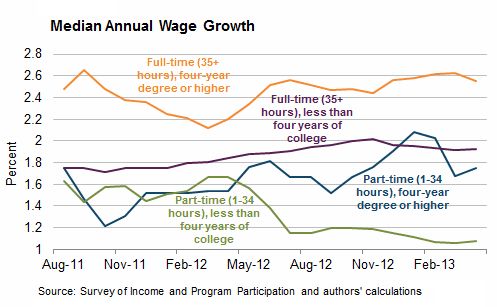 But it gets even worse when wage “growth” of part-timers is plotted by education. Look how part-timers with less than four years of college are getting smacked (mercifully, the study doesn’t separate out the fate of part-timers with only high school diplomas or less; we wouldn’t want to see this). Note what happened when rumors started circulating in 2012 that the Fed would kick off QE3: wage “growth” of part-timers with less than four years of college plunged. The wage data of part-timers with college degrees begs the question: How many lawyer-bartenders, English-major-waiters, or mechanical-engineer-retail-sales-clerks are there? That’s the other phenomenon of this wondrous jobs recovery. 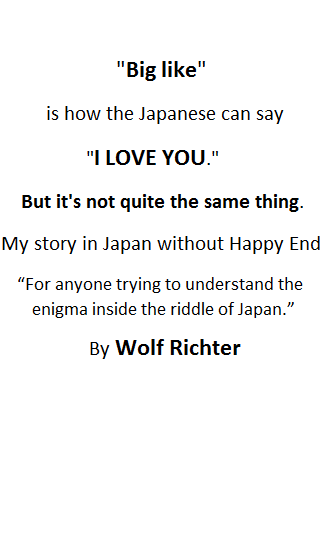 It all makes sense from a corporate point of view. During the Great Recession, companies sped up their strategic decision to switch to part-time schedules wherever possible, for a number of reasons, including lower hourly wages, fewer or no benefits (primarily health insurance), and greater scheduling flexibility. These folks work only when the company needs them. It translates into lower cost per each hour worked, multiplied by fewer total hours worked. These cost reductions performed miracles on corporate profits. And they could because desperate workers, after waves of layoffs, took whatever jobs they could get. College graduates piled into the labor markets. While many of them have found good full-time jobs, plenty of them haven’t. They face a triple whammy – the same factors that companies benefit from: fewer hours, at a lower hourly wage that doesn’t keep up with inflation, and often no health insurance. The corporate decision to cut payroll expenses by switching to part-timers is one factor in this game. The other factor is the Fed’s insistence on forcing inflation into the system to push down real wages and supply the business community with cheap labor. But these workers too are consumers and potential home buyers. And faced with these conditions, they make terrible consumers, and they can only dream of buying a home. Even with the Fed confirming that things are awful out here for the average worker, both political parties want to grant amnesty to illegal workers in the US. Congress is willing to flood our country with countless numbers of both skilled and unskilled labor to destroy the earning capacity of American workers. There are writers who claim that the republic is dead. It is becoming harder to dispute the claim as being outrageous considering the facts. the need for more population is to increase consumption spending. The attendant issue is population growth in the US is slowing and population growth was driving spending. Of course, some of the people do not have jobs skills or money so the Govt will continue to deficit spend to generate more spending. Our fiscal policy is a one trick pony–find expensive means to try to grow economy as normal structural changes are too difficult. here is the corollary: business is just as guilty as government–its the whole kit and caboodle. Few superstars in business now–use financial engineering, make employees part time and take away salary level and benefits–helps bottom line at least initially. Forget changing processes or improving productivity–thats hard work. I get it.. the pyramid is upside down and it will tip over.. because the base (those who actually do productive work to support our system) keeps getting weaker and weaker while the top (those who have not only the access but the ability to milk the system of more and more of the rewards) keeps getting bigger and bigger. What I want to know is what is keeping it from falling right now? Mickey, the idea of population growth is rather funny. All the PTB have to do is make the illegals legal and we have plenty of population growth. That isn’t the real problem is it. The problem is that those at the top do not contribute in accordance with their means and those at the bottom (lower 80%) do not have the means to service all the debt and pay the income and bonuses of the top 1%. Thus leaving the US with a collapsing retail sector. Which is a large part of the 1%’s income stream. So they perpetuate some silly idea that we just need more bodies. More serfs.. more peasants.. And then things will be fine. What insanity! In my comment ” (those who have not only the access but the ability to milk the system of more and more of the rewards) keeps getting bigger and bigger. ” it would probably be better to have written heavier and heavier and big implies size and they are large in numbers comparatively, unless you are looking at incomes or net worth. We are in the middle of the endgame kiddies. We are in free fall off the cliff just waiting for the splat. Even economicminor has absorbed Marx from his college degree. This is not a criticism of him – or her as the case may be – it is in the very air we breathe, and has been for decades. Ever notice how Hollywood only shows us CHARACTURES of Capitalists? The J.R. Ewings, Quarks, and Gordon Geckos? This was not always so. For an example see John Wayne in McClintock. They put just enough truth in these CHARACTURES and the masses swallow the Big Lie. In other words for many medium/large employers there will be an increasing temptation to fill work hours with part-timers working 30 hours. Furthermore, the effective earnings for these individuals will fall further as the healthcare costs are transferred from the company to the individual. And so the two-tier society keeps growing…..
Are there any charts which show the number of wage earners finding it necessary to work two, or even three, part-time jobs, in order to make ends meet?